Annoushka has Beetlemania , using a fabulous selection of very vibrant and clashing coloured stones she has made a selection of the most exquisite jewellery devoted to the beetle. These are real statement pieces and very dramatic ….. who can resist this eye catching ring? Annoushka's rose gold amethyst beetle ring features another delicately sculpted natural motif from the brand's well-loved Mythology collection. Crafted from high-polished 18 carat rose gold, this ring showcases a large, ornate beetle perched on a split branch band with a miniature ant crawling along the side carrying a creamy freshwater pearl. 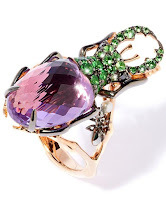 A vibrant faceted amethyst forms the beetle's body, while sparkling green tsavorite stones and black diamond eyes adorn the creature's head. With a black rhodium finish colouring the legs and elevating the sparkle of every stone, it is a beautifully bold statement piece - perfect for styling alone or wearing alongside other naturally-inspired rings from the collection.